THE Pope's representative in Ireland has lashed out at what he says is a "negative" view of the Catholic Church here – and believes it is in much better shape than many believe. Papal Nuncio Charles Brown called on Irish Catholics "not to be cowed into silence by the pressure of the scandals and negative media reports". He continued: "In spite of everything, there is still a bedrock of faith in Ireland." 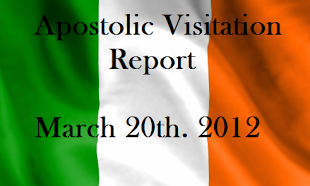 Next month, the nuncio will celebrate his first year in Ireland. The Vatican is keen to repair the church's image here after the damaging child-abuse scandals of recent years. Since his arrival, Archbishop Brown has dispensed with the traditional background role of nuncios in Ireland and stepped firmly into the public eye by travelling extensively throughout the country and not shying away from media engagement. He said: "I believe it is very important for the nuncio to be very visible and available to everybody . . . so I wanted to listen to everybody and to see for myself what is going on." The 52-year-old New Yorker, who was interviewed for 'The Irish Catholic' newspaper, said he was optimistic about the future of the Catholic Church in Ireland and insisted that this was based on what he had seen on the ground. Archbishop Brown said: "If we listen to certain segments of the media, all we get is an unending avalanche of negativity. But if you go out to parishes and talk to people and meet the priests and see what is happening, you get an entirely different picture. You get a picture of vitality, of great courage and great hope." He added that priests remained key to the future of the Catholic Church here. "There are challenges obviously but there is also vitality and there is faith here," he said. "People believe, and that is fundamental. If I can nourish that and help make it flourish, I will have done my job." The church will face a renewed challenge in 2013 as the debate on abortion legislation continues to rage. Archbishop of Dublin Diarmuid Martin has revealed that he has already received a personal threat linked to the abortion controversy. The Archbishop of Armagh, Cardinal Sean Brady, used his Christmas message to call for a campaign on the abortion issue. At a time when some are telling the church to stay out of public discourse, the nuncio said people should not "retreat into a very private faith". He said he would like to see Catholics "not afraid to express their faith in the public square".